The great American designer Oscar de la Renta included this stunning gown in his fall 2013 collection. His design was inspired by the rich colors and patterns of Central Asian ikats. While ikats are now recognized widely in Western design—from dresses to pillows and curtains—their association with Central Asia remains largely unknown to many people. Our exhibition To Dye For: Ikats from Central Asia brings together ikat-inspired designs by Oscar de la Renta and traditional ikat robes from nineteenth-century Uzbekistan. The process of transporting six Oscar de la Renta pieces from New York to Washington, DC, for the exhibition was not as simple as packing them up and sending them south. Every step was planned to keep the pieces safe and in perfect condition. A professional art handling company in New York carefully packed the couture pieces in archival boxes and then transported them to the Smithsonian. When the pieces by de la Renta arrived in Washington, they were not immediately unboxed. Even though extreme care was taken with packing and transportation, Freer|Sackler conservators took an extra step to ensure no unwanted insect hitchhikers had come along for the ride. Before the coats and dress were unpacked or even brought into the Freer│Sackler, they were taken to the National Museum of the American Indian and placed in a walk-in freezer used for integrated pest management (IPM). The costume boxes, well sealed in plastic, were kept at -40° C for a week to kill any potential insect interlopers. Removing boxes from the freezer. After twenty-four hours of re-acclimatization to room temperature, the boxes were brought into the Freer│Sackler for unpacking. A conservator noted the condition of each piece as it was unwrapped. On close inspection, staff made the exciting discovery that two robes are delicately embroidered by hand and a dress is subtly quilted. The artistry and detail are breathtaking. In the time between unpacking the de la Renta pieces and installing them in the exhibition space, each garment was carefully fitted to a mannequin and photographed. Some pieces fit right away, while others required extra creativity to achieve the perfect fit. Trying different mannequins for the right fit. After shaving down the sides here, adding some extra padding there, and adjusting the height, this mannequin was finally just right! Making adjustments to the mannequin. From the runway to the museum, these Oscar de la Renta pieces are ready to be admired in the exquisite company of the Central Asian ikats that inspired them. Visit the exhibition before July 29 to see the final stunning display! 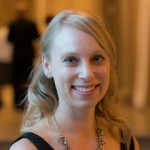 Christina Elliott is curatorial assistant to the Freer|Sackler's chief curator and the Ebrahimi Family Curator of Persian, Arab, and Turkish Art.